2 cols x 2 rows 8.5"x11"
Like Avery® 5845 and 8387, this letter-sized, pre-perforated paper produces 4 pieces measuring 4.25 inches by 5.5 inches. Their size and optional 1.5-inch bottom stub make them excellent for printing gift certificates, coupons, large tickets, or postcards. 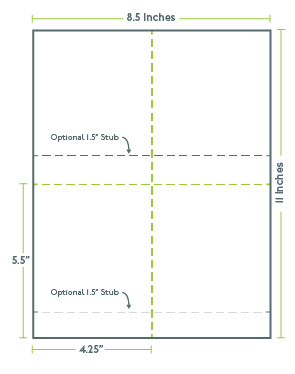 Micro-perforated with 2 columns and 2 rows, each sheet is available in several paper colors, including blue, green, and pink. Print at home or office on your copy machine, inkjet printer, or laser printer. 8.5" x 11", letter-sized sheets in the card stock of your choice. Excellent customer service, fast turnaround. Find the pre-perforated stock you need or design your own on PerforatedPaper.com.